Rarely do we see a title like Castlevania. Only a handful of titles from the 8-bit and 16-bit eras really capture a simple idea so well. 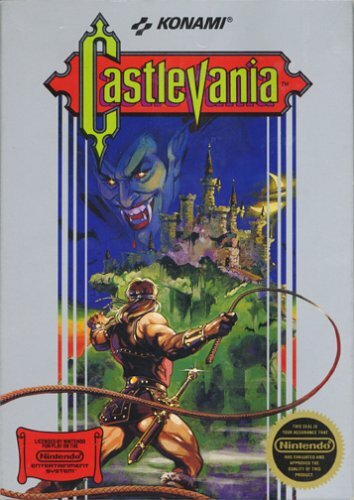 Castlevania is what some of us gamers call an "Addict Game" because this game always had a grip on you in some sort of way. Some it's the gameplay, others it's the difficulty factor and for some it's just that this game was a classic and no Nintendo collection was complete without it. E. Batica (MN) - See al.. Here is where it all started. You, Simon Belmont, must journey into the heart of Castlevania to destroy Dracula once and for all. Well, the original is still the best!STORY: 5/5. Great story! Go in. Kill all who oppose you. Very simple and easy to understand.GRAPHICS: 5/5. Incredible! Remember folks, this was the NES. When this came out, these graphics were top-notch. Sure, they made some better graphics for the NES later on, but this was when the Nintendo had very few titles to choose from. Coolest Graphic.. The Cool Guy (The City, ..